← Crafty Things to do in Yorkshire! 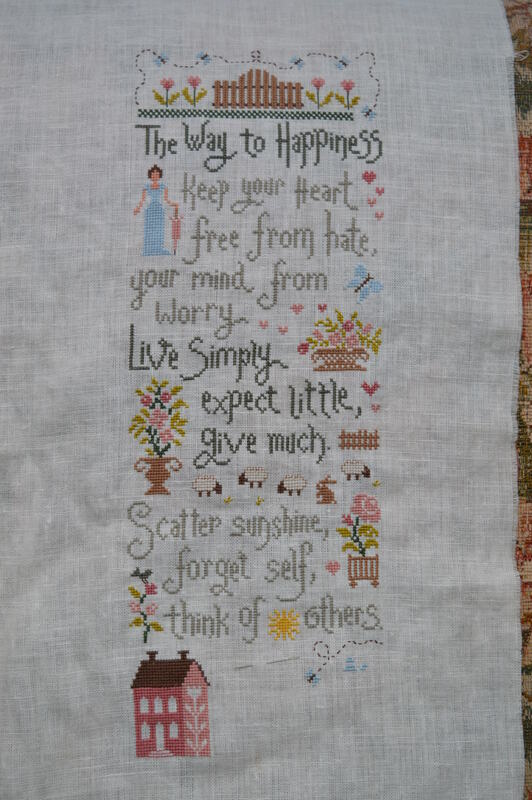 All my half hour slots for cross-stitch are adding up, I’m making good progress with my ‘Positive Thinking’ sampler from Jardin Privee. I started it at the WI Tea and Tents camping festival at the end of July, mainly because it was small enough to pack and I could quickly pull everything together I needed. I tend to do cross-stitch for half an hour or so before I go to bed, and also whilst I’m cooking tea! Last week I was pondering over the sheep, there was unanimous agreement here that back-stitching was needed to stop them from disappearing. The next decision to make was colour, I wanted to stay within the thread palette of the sampler so I tried the soft grey-green first but after 3-4 stitches I knew it was too light, it just didn’t have the desired effect. I didn’t want them to look like cartoon sheep with a dark edge, so I decided to try the mid brown that the rabbit is stitched in. I think it works perfectly, they remind me of a breed of sheep we have round here that just has that touch of brown! 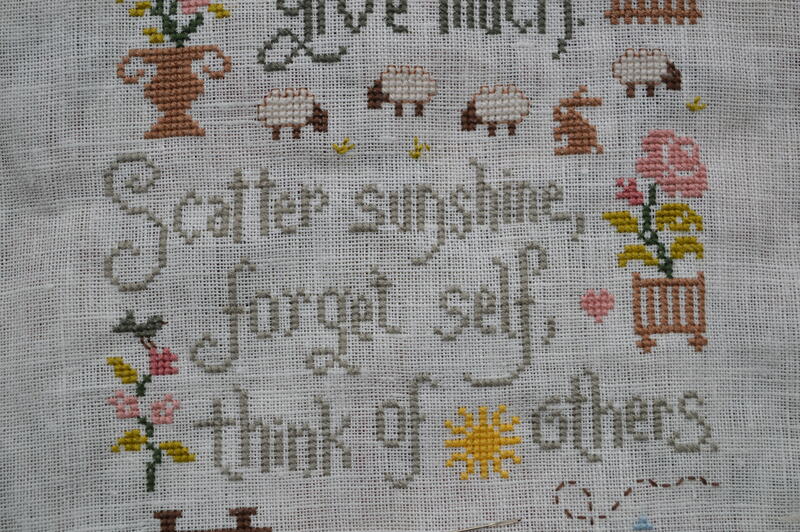 I’ve stitched all the words to the poem now, my favourite line has got to be ‘Scatter sunshine’ it’s so simple but expressive, though apparently to caused the most trouble in translation! I’ve just got the last section to complete, hopefully this week, I’m already thinking about my next project, a big one (like really big!!) from Jardin Privee. 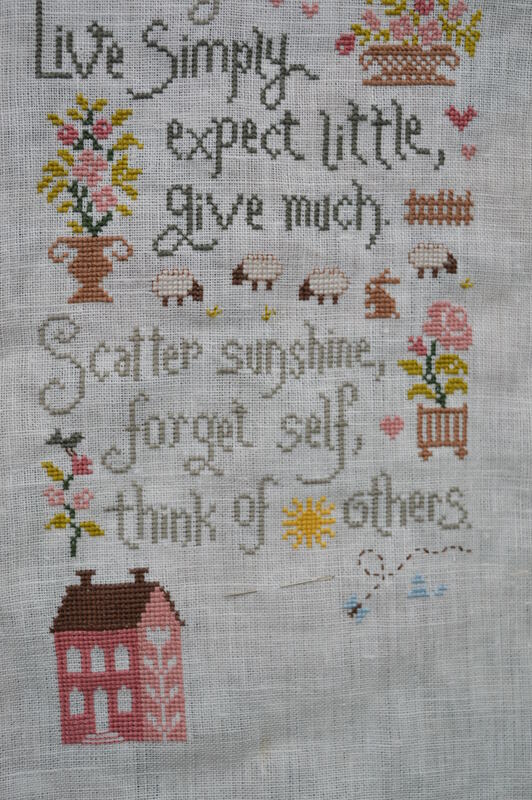 This entry was posted in Sewing and tagged cross-stitch, Jardin Privee, sampler. Bookmark the permalink. Your sheep are perfect now! I love the sentiments in this poem. Thanks for spreading a little sunshine today! Your sheep look much better now. This is so pretty. Enjoy your stitching. Fabulous… the sheep are beautiful! Thanks Kathy, I love the sheep and the rabbit! Lovely progress….a bit at the time really moves you forward. Oh I like the way you stitched the sleep. They turned out perfect. This is a lovely quote. For me… that part of about keeping the mind free from worry is good to remember. And I love the Scatter Sunshine as well.